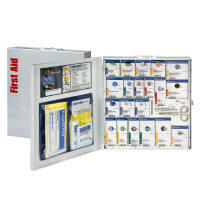 OSHA Smart Compliance™ First Aid - Guaranteed OSHA & ANSI Compliance First Aid Kits & Supplies: The home of Smart Compliance First Aid and the Smart Compliance ezRefill system! 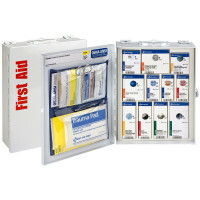 The ONLY First aid cabinets that GUARANTEE OSHA Compliance...SmartCompliance™ OSHA First Aid Cabinets. 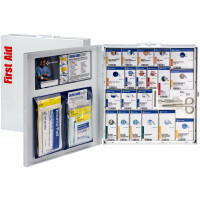 Since we introduced this program in 2005, it has been the most popular and effective OSHA Guaranteed First Aid Program in the USA. 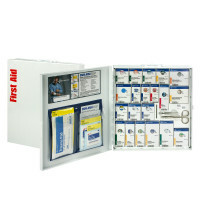 Buy your Smart Compliance Cabinets, Register your OSHA First Aid Smart Compliance Kits, and even order your SmartTab™ EZ Refill First Aid Items or SmartPak™ ezReorder System to keep that cabinet OSHA Compliant and up to date... ALL Right here. Buy It Online Here!!! 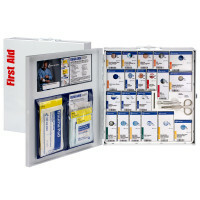 GUARANTEED OSHA Compliance First Aid Program! We've made it easy. 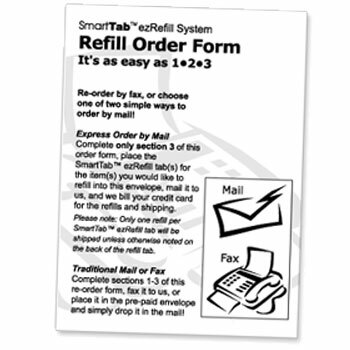 Simply keep your account active and use the SmartTab™ ezRefill System to order refills...and we do the rest! 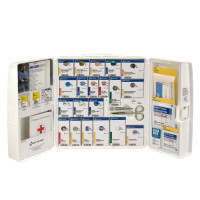 The service includes a comprehensive first aid cabinet with over 200 pieces. 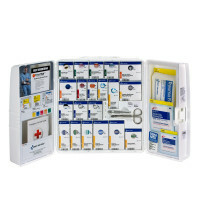 Replenishment options are available to meet your organization's needs. Automatic, no-cost update of items affected by OSHA regulatory changes are included. Cost effective, and easy to use, the SmartTab™ ezRefill System makes reordering refills simple and quick. Reorder the way YOU like, on the web using our "Online Express Lane", or by fax, phone, or mail — you get to choose. The service costs pennies per day and automatically renews annually, so take the effort out of keeping your business OSHA compliant — and sign up today. The SmartCompliance™ First Aid Program offers the total package. 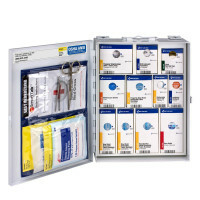 Cabinet Tracking: Registering your cabinet's unique identification number allows you to take advantage of SmartCompliance Program including the OSHA compliance guarantee and regulation monitoring. Expandability: Customize your cabinet to meet your needs. Add items from our expanded product list. 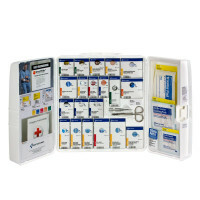 Customization: The expansion pocket provides a convenient location to store additional first aid products specific to your needs. Contact your distributor for pricing and availability. 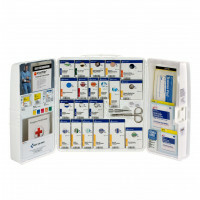 SmartTab ezRefills are a cost-effective alternative to traditional first aid services. 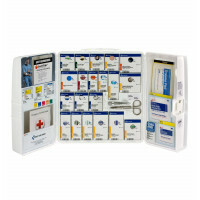 As you use your supplies, yellow SmartTabs will appear, providing all the information you need to reorder the correct supply for your cabinet. • At-a-glance monitoring tells you when it is time to reorder. 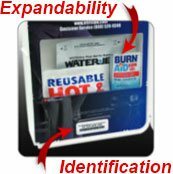 • Proprietary "Snap-in" refill boxes. 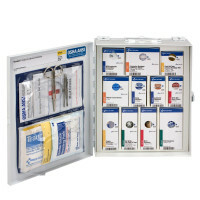 • Your cabinet is always organized. Reorder by phone, fax, mail or online. Order what you need when you need it. Choose the method that suits you. 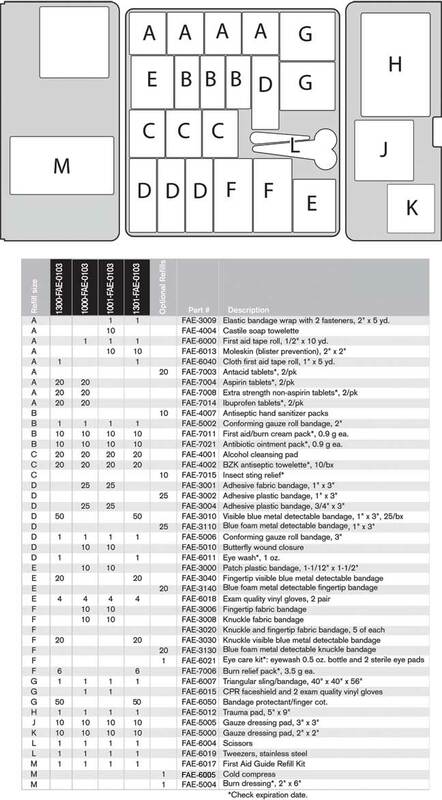 Your cabinet ID number makes reordering quick and easy. Easy reordering: Order refills from your distributor quickly and easily. With the SmartTab ezRefill system, you order only what you need when you need it, at a savings of up to 30% or more. Toll-free Customer Service Center (800) 933-8495. Nation Wide Support. Click Here to contact our customer service center online. 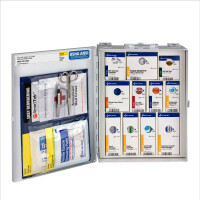 Annual replenishment: Automatic refill of all cabinet components. Refreshes all dated supplies. 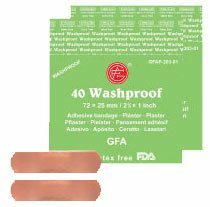 Guarantees ongoing OSHA compliance. 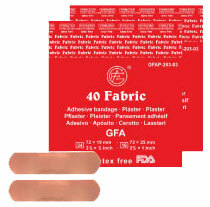 Excludes scissors, tweezers and first aid guide. 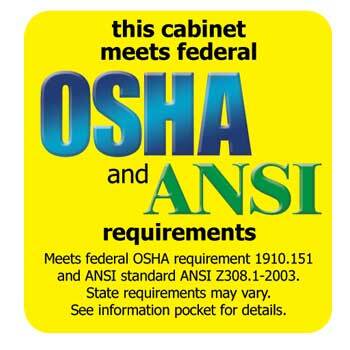 OSHA/ANSI Compliance: Guaranteed OSHA Compliance. Complies with all ANSI requirements. Guaranteed OSHA Compliance. 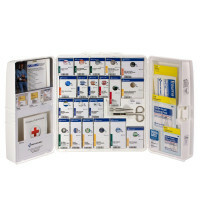 Simply maintain your cabinet using the smart tab ezRefill System to remain OSHA compliant. 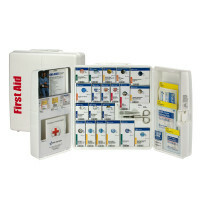 If regulations change in a way warranting a first aid update, you will be automatically notified.